These ESL worksheets are about transportation vocabulary and sentences. 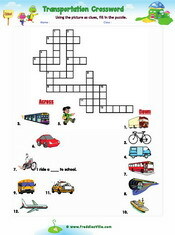 There crossword puzzles and classroom survey exercises on means of transportation. This ESL exercise is communicative and the learner will ask two friends about their means of transportation and report back to the classroom or teacher.